Glow Research plasma systems do not arc or spark, and tune extremely fast. Our systems are designed to strike a plasma as low as 10 watts. Our systems report the RF power actually going into the chamber in 1 watt increments. Glow Research Systems are used in Production as well as R&D applications. organic removal, photoresist removal, decap, bonding (PDMS), and FA applications. High purity quartz chambers or anodized aluminum chambers are available. We provide reasonably priced and reliable plasma systems. We want our Customers to focus on their research or production. Biomedical and the Semiconductor industry. 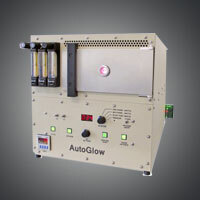 The AutoGlow plasma cleaning system has a quartz chamber and a variable 10-300 watt 13.56 MHz solid state generator. The system provides very efficient plasma for lab and production applications with automatic tuning. Adjust power in one watt increments. For use with O2, Ar or N2 gas. The GLOW plasma system is designed for high reliability and affordable pricing (under $6,000 dollars). It Operates at 100 kHz, ----- no tuning is required! The GLOW is suitable for lab, university or production applications. It can perform a host of applications such as plasma cleaning, removing photoresist, prebond cleaning/conditioning, PDMS bonding or organic removal. 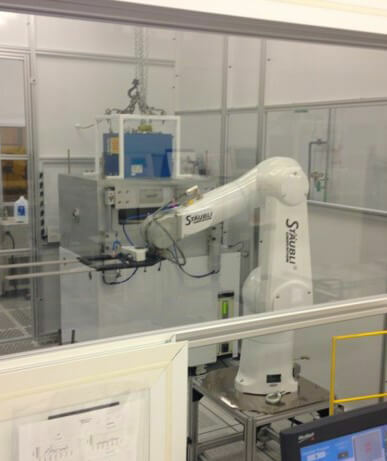 Pictured is an ICP plasma system designed for 370mm (14.57”) x 470mm (18.5”) substrates interfaced with a 6 axis robot. 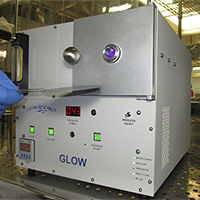 Glow Research provides custom plasma systems for various size substrates and chamber configurations. Our experience with RF design, RF matching, software control and system integration allows us to provide systems to meet various Customer needs. Glow Research makes plasma cleaning systems that are easy to use, extremely reliable and produce a plasma that will allow the user to easily complete the plasma process with the best results possible. Glow Research makes the entire system (RF generator, RF matching, control system, chamber and gas flow modules). Our systems are used in 3 shift/day production as well university/R&D applications. Our systems allow our Customer to attend to work they need to accomplish with the support of a reliable plasma cleaning or etching system. Glow Research has taken over the world-wide responsibility for parts and service for several older units from Nordson MARCH (March Plasmod, March Super Plasmod, March PM-600 and March Jupiter RIE systems). Take a look at what rebuilt systems we have to offer.